Congress is not poised to act, and none of the major gun-control groups even have a position. The mass shooting at the Pulse nightclub in Orlando raised a pressing question—why are civilians so easily able to purchase military-style weapons capable of immense destruction? The public is rightly horrified at the killing power Mateen wielded. At one point he fired 24 shots in nine seconds, and took 49 lives in a remarkably short period of time. Some survivors had calves and forearms blown off entirely by Mateen’s assault rifle. 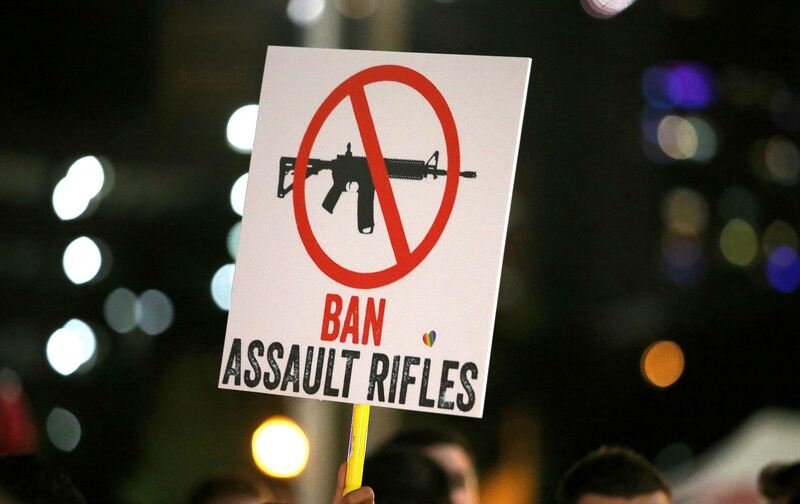 Polls show support for an assault weapon ban ticked up 13 percent after the shooting, with a majority of Americans (57 percent) now supporting one. In Washington, however, Clinton is standing nearly alone. There will be no imminent movement on assault weapons in Congress, and none of the major gun control groups that have been ascendant since Newtown even have a position on an assault weapons ban. Senate Democrats did score a rare victory in the gun control fight late Wednesday, after Republicans in the chamber agreed to a vote on two pieces of gun-control legislation following a 14-hour filibuster launched by Senator Chris Murphy. Though the situation is still fluid, as of Thursday morning Senate majority leader Mitch McConnell is prepared to allow votes on two bills: one that would deny gun sales to people who are or have been on the terror watch list, and another that would expand federal background checks for gun purchases to online sales and gun shows. The prospects of the latter bill passing are almost nil (similar legislation couldn’t even clear 60 votes right after Newtown, when Democrats held the chamber), and then it’s not clear the bill targeting suspected terrorists will pass either. This might please civil libertarians, who have well-founded concerns about that legislation. Speaker Paul Ryan surely wouldn’t allow a vote on Cicilline’s legislation, but Democrats could make an issue of it if they chose. They could file for a discharge petition, for example, a parliamentary procedure that allows for the body to force a vote if enough people sign on. A petition on the assault-weapons ban likely wouldn’t get enough signatures to force a vote, but at the least it would put members on the record for or against assault weapons. According to a congressional source close to the talks, many House Democrats were actively discussing a discharge petition this week. But it doesn’t appear that it will happen. In the upper chamber, Senator Dianne Feinstein has repeatedly introduced legislation that would ban assault weapons. It received a vote after Newtown, but failed. Senate Democrats The Washington Post earlier this week they may revive that bill, though there are no specific plans so far. Hoyer is not wrong that an assault weapons ban would go “nowhere” (though neither will legislation closing the gun-show loophole). But lawmakers have an understandable tendency to work towards only the most immediately achievable goals. That’s not generally true of outside pressure groups—and yet, none of the major pro–gun control organizations are joining Clinton’s call either. None of the three most politically active groups—the Brady Campaign to Prevent Gun Violence, Americans for Responsible Solutions, founded by former Representative Gabby Giffords, nor Everytown for Gun Safety, former New York Mayor Michael Bloomberg’s organization—even have an official position on whether assault weapons should be banned. Folmar is right on both counts, though, as she added, assault rifles “put the ‘mass’ in mass shootings.” They are not used in the majority of shootings where four or more people are shot at once, but they are the hallmark of headline-grabbing mass shootings like Orlando, Sandy Hook, Aurora, and Columbine. Assault weapons are also a huge financial boon to the larger gun industry. Gun sales were actually in a decades-long decline until somewhat recently, due to the declining popularity of hunting and an aging population of gun owners. Between 1980 and 2000, the US population grew 24 percent while small domestic arms production fell 33 percent. But for now at least, it appears Clinton will be a lonely voice pushing to ban assault weapons among the institutional gun control movement.